For years, I have been under the impression that the gas sold at 7-Eleven was owned by Venezuela. This assumption led me to believe that purchasing their gas would be supporting the previous dictatorship regime of Hugo Chavez, which led me to take my business elsewhere. I recently realized I was basing this belief off what a friend once told me, a friend whose name I can’t even remember. I had never checked my facts! My boycot of 7-11 was based on a rumor, so I did some research to get the facts. This bothered me because I had been punishing a U.S. business that I had nothing against. I was basing my decision to boycott the gas at 7-Eleven off merely a rumor! I try not to make decisions based on rumors as much as I can, but alas, I am nowhere near perfect when checking my facts. I try not to disseminate information unless I know it to be true to the best of my ability, but that is easier said than done. On May 15, 2017, the Wall Street Journal published an article titled “Creditors Crowd Around Citgo.” The article explained that Venezuela currently owes creditors for bonds totaling approximately 10 billion dollars. One of the only producing assets that Venezuela owns is Citgo, and as a result, Venezuela has pledged all Citgo equity as collateral. This means that all the profits from Citgo go directly to both the bondholders and to the state-owned Russian oil producer, Rosneft. So how do the bondholders plan to get repaid and protect their assets? Wall Street has determined it is not a question of “if,” but “when” Venezuela will default on their bond loans. Imagine that… a “socialist” country ran by a dictator going bankrupt! Over the last 30 years, Venezuela has nationalized various private businesses and assets. The oil industry was an especially big target of nationalization and not properly compensated, except for Citgo. In 1986, 50% of Citgo was sold to the state-run Venezuelan company Petroleos de Venezuela SA (PdVSA). In 1990, the remaining 50% was again sold to the same company. When dictator Hugo Chávez died in 2013, he left behind an economic crisis in Venezuela. As a result, Nicolás Maduro, who won the presidency following Chávez by slim margins, has been using his power over the military to control both the people and the legislative process. As Maduro expropriated certain industries, he began to use PdVSA to pay for the generous social welfare benefits he promised in order to win votes. This system does nothing to save for a rainy-day fund necessary for future problems. In addition, as private businesses were nationalized in this system, new businesses were discouraged to start up. Today, Venezuela depends on oil for about 95% of its export revenue with no diversification in sight due to the previously mentioned challenges for businesses. With the recent drop in oil prices, there has been a 75% decrease in Venezuela’s oil revenue. As always, there is so much more to the story. It is complex and not always clear as to where, who, and how it all works. I could spend a lot more time researching and learning about it all, but there are more pressing things to accomplish in my life. With all this information, I am able to confirm the rumor I heard that Citgo is owned by Venezuela. But of course, it’s not that simple. Citgo assets are all United States based, which complicates the situation for all the creditors, especially the Russian oil producer, Rosnef. All 56,000 7-Elevens are owned individually by private business owners that have nothing to do with Citgo except for Citgo being their gas provider. The planet is getting smaller, not from global warming, but because we truly have become a world economy, and that cannot be ignored. 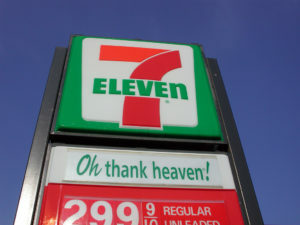 As for the rumor that led me to boycott 7-Eleven’s gas, I think my research has led me to be likely to continue with that habit, however, I am not going to go out of my way to make it happen. When are countries going to learn that nationalizing private business is the same as killing the goose that lays the golden eggs?